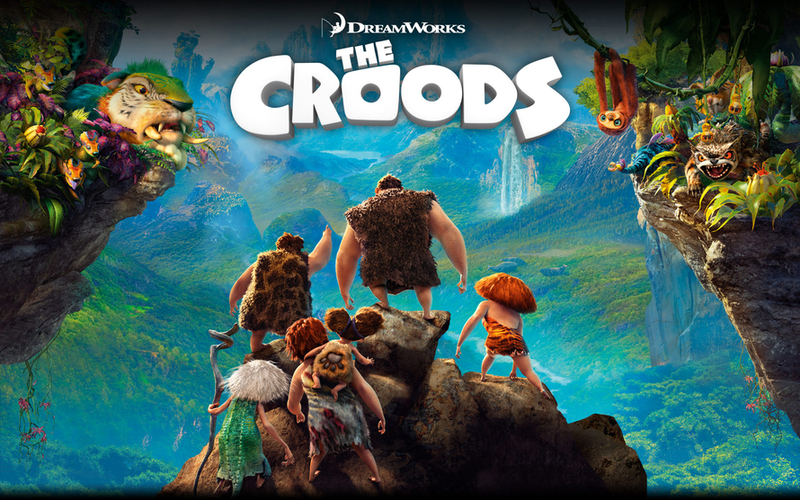 Dreamworks' latest kids animated feature, THE CROODS, is a major disappointment. It has basically the same story as the wonderful HOTEL TRANSYLVANIA, but without the visual style, the wit, the poignancy and the gentle homage to its cinematic antecedents. Emma Stone voices Eep, a teenage Neanderthal rebelling against her father Grug's fear of all things new. This extends to her new more advanced Homo Sapiens boycrush Guy (Ryan Reynolds) - the kid who knows how to make fire, and shoes and whatnot. After a nasty attack on the family cave, the Croods head off on a road trip to "tomorrow" (I kid you not) with Grug (Nic Cage) and Guy increasingly at odds until, this being a kids film, it all ends happily. Director Kirk DeMicco (SPACE CHIMPS) and Chris Sanders (HOW TO TRAIN YOUR DRAGON) have fashioned a script so completely ham-fisted and devoid of humour as to give their starry cast little to work with. Stone and Reynolds are utterly wasted. The visuals are polished, but in a manner we have come to take for granted from CGI animation. There's none of the layered comedy that filled TRANSYLVANIA, or even PARANORMAN - and none of the teary-eyed family moments that made those two movies adorable and memorable. The whole thing was just banal and derivative. THE CROODS played Berlin 2013 and is currently on release in the USA, Mexico, Indonesia, Argentina, Bahrain, Bolivia, Chile, the Czech Republic, Denmark, Dominican Republic, Germany, Hungary, Israel, Italy, Kuwait, Portugal, Puerto Rico, Macedonia, Russia, Serbia, Singapore, Brazil, Canada, Colombia, Costa Rica, Ecuador, El Salvador, Estonia, Guatemala, Honduras, India, Ireland, Lithuania, Nicaragua, Norway, Panama, the Philippines, Romania, Spain, Sweden, the UK, Uruguay, Venezuela, Belgium, Iceland, the Netherlands, Australia, Hong Kong, Slovenia, Bulgaria and Finland, It opens on April 4th in Thailand; April 5th in Poland; April 10th in France; April 11th in New Zealand and April 18th in Greece. THE CROODS has a running time of 98 minutes and is rated PG in the USA. I'm wondering if you've ever seen Hotel Transylvania or The Croods. They are absolutely NOTHING alike. Horrible review.